If you’re visiting this blog then it’s odds on that you already know about the Pan Books of Horror Stories, of course you do – we all know them, we all love them. They’re the cornerstone of the horror anthology world. Ok then, they were a series of horror anthologies which ran between 1959 and 1989 edited by the great Herbert van Thal from the first edition in 1959 until his death in 1983. Clarence Paget took over the helm for the last few stragglers until they were put to rest on their 30th issue due to a general lack of interest, drop in quality and, let’s face it, short stories (especially horror short stories) just weren’t very fashionable any more. It seems fitting to start the blog with Pan’s forerunner of the series. 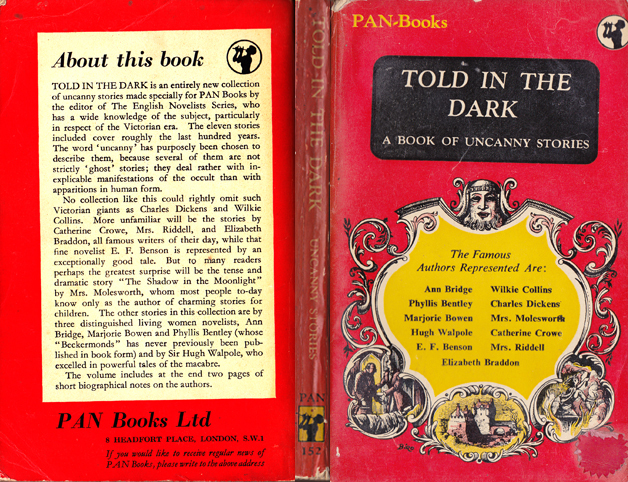 Told in the Dark – A Book of Uncanny Stories was published in 1950 and was created by Pan’s expert on Victorian literature and editor of their ‘English Novelists’ series, the same Herbert van Thal. The cover illustration is by Hungarian born Val Biro who sadly died earlier this year. And while we’re on the subject of illustrations and Pan books, y’know the Pan logo? The silhouetted Pan playing his pipe (in the image above)? That was designed by Mervyn Peake of Gormenghast fame, that was. The contents are mostly Victorian and Edwardian classics and it’s perhaps easy to think of the selection as quite safe choices, they were all used again and again in various anthologies over the next couple of decades, but you have to remember that we’re still in the relatively early days of the paperback book here so they would have been quite new to most readers.